Investment in Anexia’s new Backbone Europe is coming at just the right time, as was proved in March this year. Strengthening our network allowed Anexia to very quickly fend off Austria’s largest ever DDoS attack, which was carried out against one of our customers. 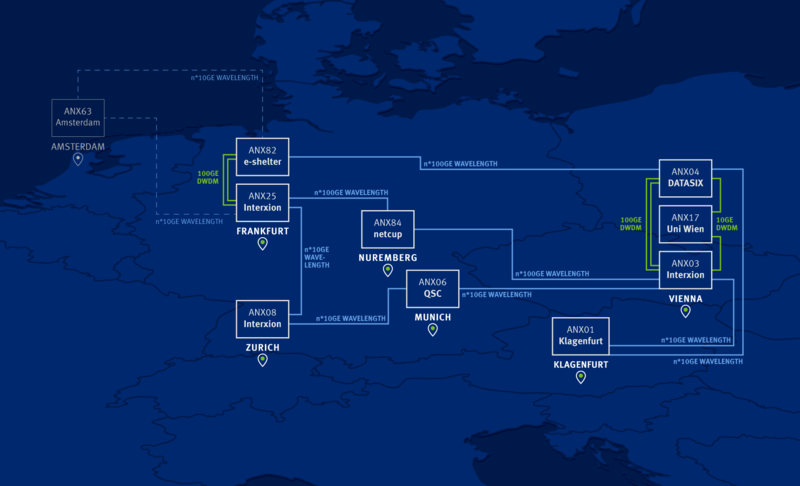 Now Anexia’s Backbone Europe expansion continues, with June 2018 seeing our Munich and Zurich data center locations integrated into the new Backbone Europe. Launched in 2017, the Backbone Europe project is now extended to these two locations to enhance bandwidths and redundancies between Germany and Austria. In Zurich, we have been working solidly for years with data center operator Interxion, one of the top providers of data center services in Europe. The data center is directly connected to the SwissIX internet exchange point, and we have been able to expand the connectivity of our server and network infrastructure to multiple 10GE. For more on the partnership, see this video. Our partner at our Munich server site, QSC, also has an extensive history of dependable work with us. The highest standards are vital for Anexia’s work and the security of our customers’ data, and QSC is able to put forward three further audits in addition to ISO 9001 and ISO 27001 certifications. In Munich, too, we have now been able to integrate multiple 10GE into Backbone Europe. Find out more about Backbone Europe here.